This post was created in partnership with Chicken of the Sea. What kind New Year’s resolutions do you set? I’m not huge on changing my diet drastically and prefer a more moderate approach (but always gluten-free because I have celiac!) with healthy eating. 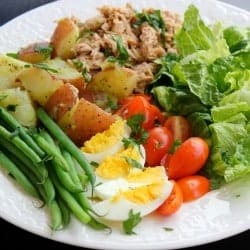 One goal that my husband and I made is to eat more healthy lunches. He is a busy software developer who started a company a few years ago and doesn’t have time for long work lunches. And I get really busy with the kids at home so it’s hard to find the time to sit down and make myself a healthy lunch. Something we’ve been doing to stay on track with healthy lunches during the week is meal prep! Cooking once, and being able to eat a few times saves me during the week. If I have a healthy quinoa salad waiting for me in the fridge I’m definitely more likely to eat that than random scraps off my kids lunch plates. 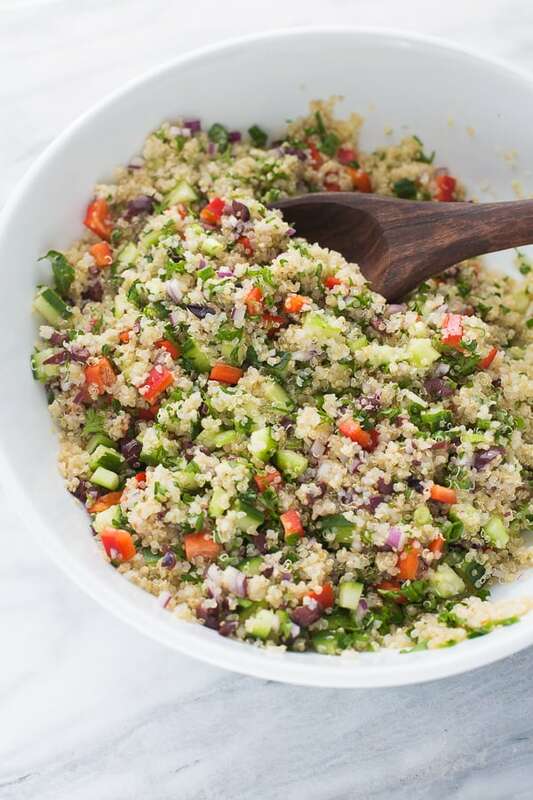 I love this quinoa salad because you can make a huge batch of it and it stays good for lunches all week. 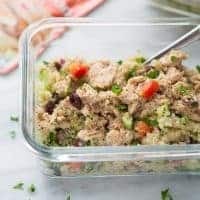 I especially like topping quinoa salad with salmon or tuna for a little added protein and omega-3s. The 2016 Dietary Guidelines advise Americans to eat 2-3 servings of seafood per week to greatly improve your overall health. This can be hard to do, but with products like Chicken of the Sea Flavored Salmon Pouches it is much easier to get the needed servings of fish! 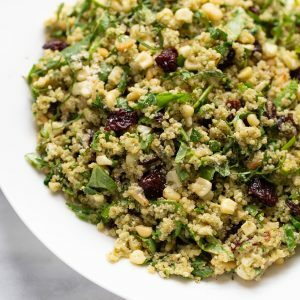 I love the Lemon Pepper flavor with this quinoa salad. Chicken of the Sea is hosting a Go Fish #EatMoreSeafood promotion from January 9-March 15. You can enter on the Chicken of the Sea Facebook Page or by using the hashtage #eatmoreseafood on Instagram or Twitter. Each week one winner will win a $100 Visa giftcard and one overall winner will win seafood for a year! 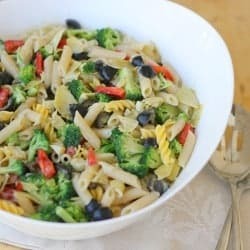 I definitely feel energized and healthier when I eat a healthy lunch and this is one of our favorites. 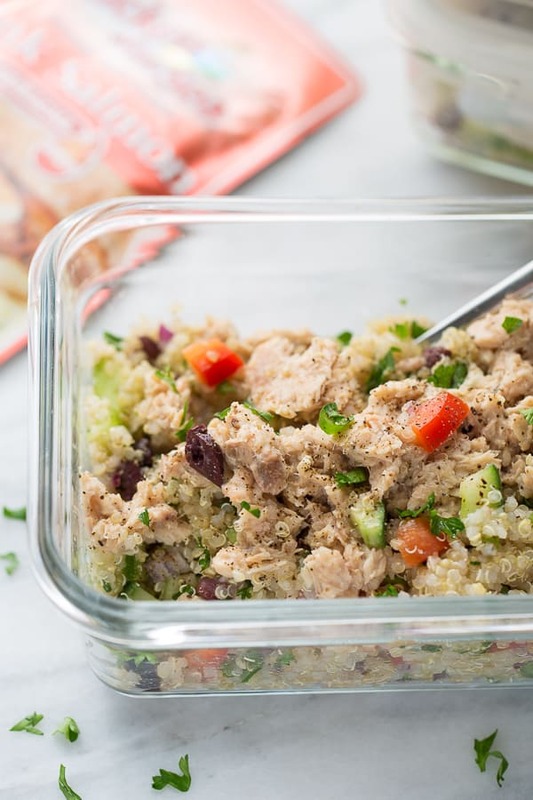 A quinoa salad topped with salmon has it all – veggies, whole grains, and lean protein! Cook the quinoa according to package instructions until fluffy and cooked through. While the quinoa is still warm, add the lemon juice, olive oil, and salt/pepper to taste. Toss to combine. Add the remaining ingredients and toss to combine. 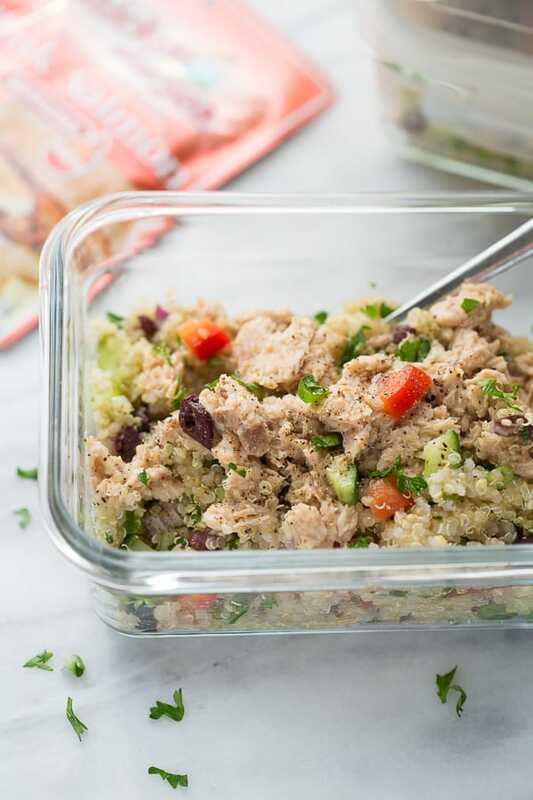 Divide the quinoa salad up into 4 lunch-sized portions. 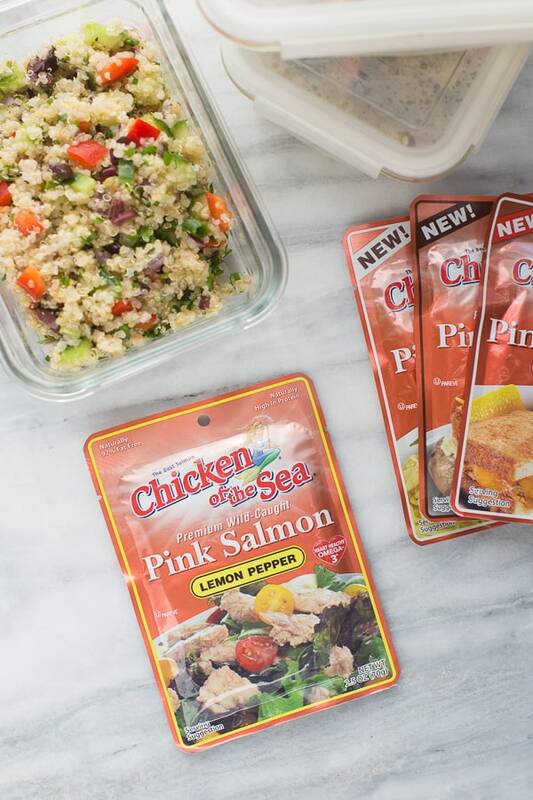 When ready to eat, open a pouch of Chicken of the Sea® Lemon Pepper Flavored Salmon. Top with freshly ground black pepper and enjoy!